[AUTO]:[Counter Blast (1)] During your end phase, when this unit is put into the drop zone from (RC), if you have a «Great Nature» vanguard, you may pay the cost. 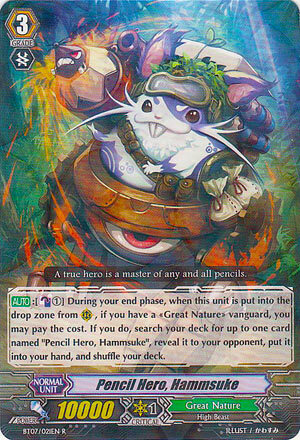 If you do, search your deck for up to one card named “Pencil Hero, Hammsuke”, reveal it to your opponent, put it into your hand, and shuffle your deck. Bleh. If he were a 12k attacker or something maybe polaris could have used him, but as it stands he was sort of passed over. Leo-pald strengthening a Magnet Crocodile/Stamp Otter just did more.